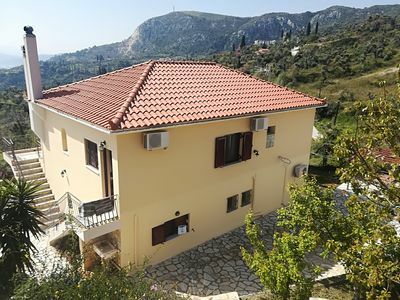 The estate BlueWhite is brilliantly situated close to the sea offering a breath-taking view of the Mediterranean sea, the cliffs and the fantastic White Mountains. 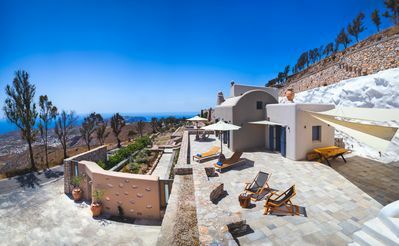 BlueWhite is the perfect private holiday retreat for 4 to max 10 persons. 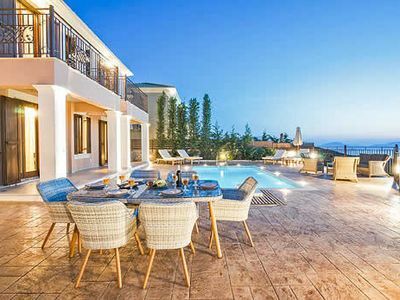 The two houses with a total of five bedrooms, and a kitchen in each house, are designed for maximum comfort and individual freedom for an extended family or friends on holiday together. The two houses can only be rented out together. 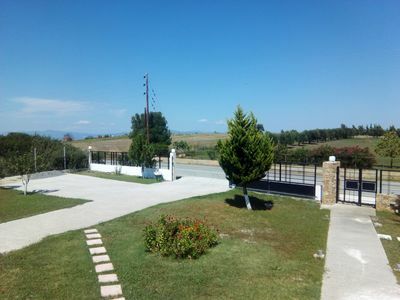 The buildings of 340 m2 are set in a 6000 m2 private olive grove with more than 100 olive trees. The renters are offered to enjoy the cold pressed, organic, extra virgin olive oil from BlueWhite. Enjoy swimming in the 18 meter long saltwater infinity pool. 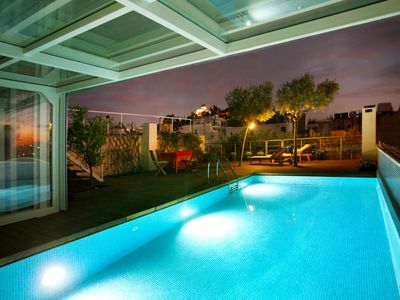 Get the luxurious feeling of walking barefoot on the sundeck covered with travertino marble. Have a rest from the sun under the pergola at the soft cushioned poolside lounge. 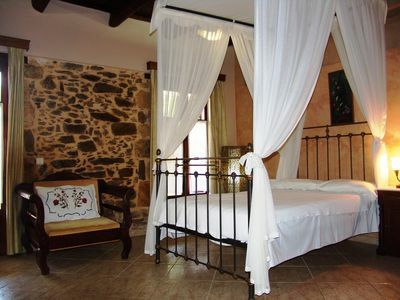 Or enjoy your siesta in the hammock in the shade, under the the beautiful olive trees. If you prefer having a swim in the sea, you can walk a short distance down to the cliffs and jump into the clear and fresh salt water. 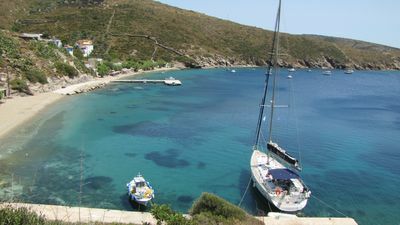 The lovely, shallow, sandy beach in Almyrida is also within walking distance. Here you will find plenty of restaurants, tavernas and bars. Diving, deep sea rafting, paddleboards, surf boards, kayaking and rental of mountain bikes are also offered there. 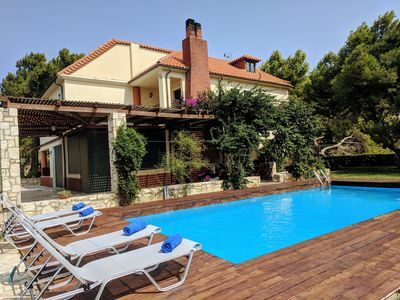 If you are in the mood for cooking you will have a great experience at the fully equipped outdoor kitchen, surrounded by beautiful old olive trees. And do not forget to bring some fresh herbs from the herb garden! The al fresco dining area is the perfect spot for enjoying the sunset. Another good choice for your evening meals is visiting the charming village Plaka, which you easily reach some 400-500 meter by foot. 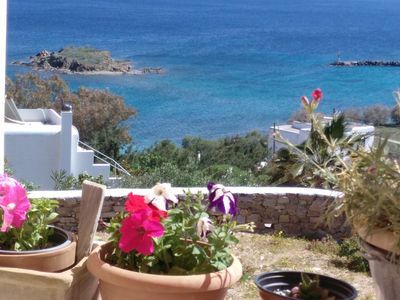 Here you will find grocery shops, restaurants, tavernas and bars, all highly recommended. When approaching the estate, you will find a gate to be opened by a remote control. BlueWhite consists of two houses,- the stone house and the white house. The stone house consists of two bedrooms with double beds and two bathrooms, one wiht a bath tub, all en-suite. 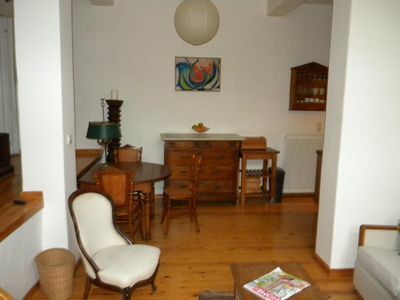 There is a fully equipped kitchen, living area and a furnished terrace. The white house consists of tree bedrooms with double beds, three bathrooms, one with a bathtub, all en-suite. 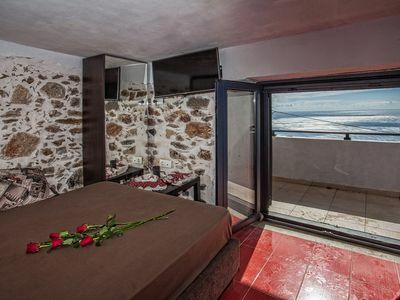 The master suite has a spectacular sea- and mountain view. On the top floor you will find a stunning kitchen, dining and living area. 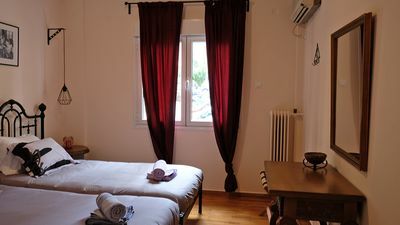 The first floor offers a nice and cozy restroom with comfortable sofas. On the basement floor you will have a fitness room with some training equipment. All beds have top quality anti allergic, luxury mattresses, from Coco Mat and Media Strom. All windows in bedrooms and living rooms in both houses have mosquito screens. At BlueWhite there are several comfortable outdoor resting areas. 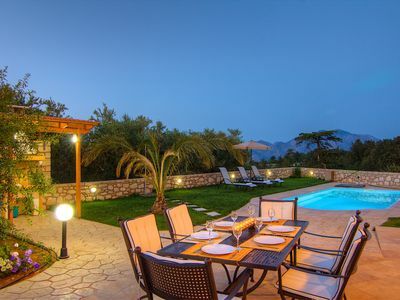 The estate will in this way provide each of you with the feeling of tranquility and privacy. and not to forget environmental sustainability. 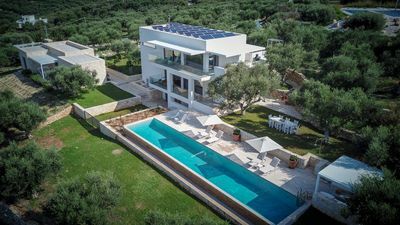 BlueWhite is the first A+ house on Crete, and it is the southernmost PlusEnergy house in Europe. The buildings are equipped with the latest technical solutions for comfort and temperature regulations. At the BlueWhite you will find design icons by well known Scandinavian, Dutch and British designers, along with contemporary art. In the garder, in the shadow of the olive trees, there is a bole court of 3 by 15 meter. The beautiful olive grove seaside area surrounding the BlueWhite estate, is perfect for walking, cycling and jogging. 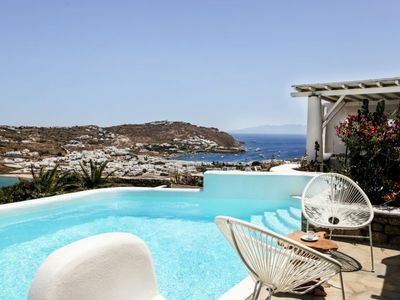 Great seaviews and sunsets at this traditional village villa. 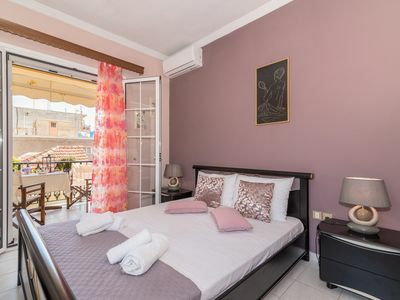 Smart modern interiors within walking distance to tavernas and shops. 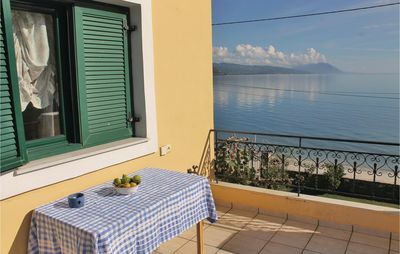 15 minutes drive to Fiscardo and beaches.